Super Savvy Mommy: KABOOST Review and Giveaway!!! Thanks to the wonderful people over at KABOOST, I am able to introduce you to the latest product to help simplify a typical crazy Mommy day. What is KABOOST you ask? KABOOST is a compact and portable chair booster that raises the height of kitchen and dining room chairs so your child can sit at the table just like a big kid. With KABOOST, the entire dining experience is enhanced for both child and family. I was impressed to learn that KABOOST will support up to 300 lbs! How incredible is that?! It should also be said that KABOOST won the iParenting Media award for being so innovative and amazing. Dexter is still a little young to sit on a chair by himself but I was eager to try out the KABOOST with Dexter's portable highchair that attaches to a dining room chair. The KABOOST was lightweight (so easy to carry and very portable). We brought it over to my in-laws house for dinner over the weekend. Not only was Dexter able to sit up higher (like a big boy!) but I wasn't nervous about him tipping over or falling off of a chair. The only thing I regret about my KABOOST adventure is that I neglected to bring my camera along for pictures!! I will next time though! Did I mention that my KABOOST also happens to be lime green?! MY FAVORITE COLOR!!! How would you like a chance to win a KABOOST of your own? 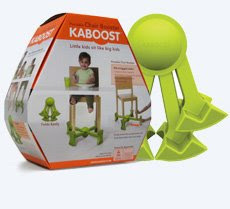 All you need to do is head over to KABOOST and take a look at their amazing chair booster. Come back here and let me know which color, besides lime green, that you would like to win. The chocolate one is my fav. Would love the chocolate brown one! You know I want the chocolate!!! I'd love to try the Hypoallergenic Shampoo for my itchy doggy from the eco store! safe-tots.com is a retailer for cover plugs. I'd love to win the chocolate one. Thanks for the chance! I became a follower on Blogger. Thanks! Chelsea's Room is one of the stores that carry Cover Plugs. I visited Eco Store USA, and their Vanilla shampoo and conditioner look great! I love the scent of vanilla! I like the chocolate color! The lime green is my favorite, followed by the Charcoal as a runner up. Thanks! I would love it in chocolate to match our chairs. the Kaboost in chocolate would be a lifesaver! my daughter is 14 months old and does NOT want to sit in a high chair, but rather in a regular chair like a big girl. of course, because she's only 14 months old, a regular chair isn't tall enough. so, you see, Kaboost is the perfect solution. I love the chocolate color, goes with anything! Thanks for the great giveaway! ooh the chocolate one is beautiful and would match our chairs. Our 2-year-old daughter has been asking to sit in a "big chair" lately...without her booster seat! But she's not quite tall enough so she always ends up on her knees or standing up! The KABOOST would be perfect for her! The Chocolate color is my favorite...and I love that the KABOOST is so compact. It looks small enough to just toss in the car when going out to eat or to a friend's house for dinner. I like the Kaboost in Chocolate. Found this contest in Prizey! I would choose the natural color. The chocolate is my favorite. Thanks for the chance! I would love to have this in Chocolate. Bergstrom's Childrens Store carries cover plugs. Where's my post? I said previously, I like the chocolate too. Thanks. I love the chocolate brown one! I found your site through Prizey.net! Following you on Twitter (ctb0520). I like the Citrus Spray Cleaner from the Eco store! You can order the Cover Plug from babylove.com. I'm lovin' on the Natural color. Where has this thing been all my life?? I like the charcoal Kaboost. Thanks for the chance. We prefer the chocolate model. Thanks for the giveaway. I would love the chocolate. We really have been wanting one of these. The chocolate would work great. I like charcoal--but neutral is a close second. Gosh Eco Store thinks of everything- eco friendly ear wash for dogs??? Totally cool! I am all about adapting what you have rather than getting more stuff! My fav is totally the lime green, but the chocolate is pretty cool too. I'd like the chocolate kaboost. I'd love to take the booster seat off of the kitchen chair and put it in storage. This seems like a better system. Your button is now in my sidebar. The chocolate would match our dining set! Follow you on Twitter (a i t m a m a). I found your site via All American Mommy. I visited EcoStore and like the Pure Oxygen Whitener - would love to try it! You can find CoverPlugs at Baby Love - and, coming soon, at One Step Ahead. I like the natural color. I originally found your site through Prizey, I believe, but it has been a little while, so I am not totally positive. I am really glad I found you though. Dexter is the cutest little bean! I love to read your blog and see his antics, and also you have some rockin' giveaways girl!! EcoStore is great and I love their selection of products. I would love to try the Baby Sleepytime Bath Wash with lavender......maybe I would keep it for myself, because it sounds heavenly......especially with No Nasty Chemicals. The Chocolate would fit my kitchen wonderfully! Thanks for the chance! I faved you on Technorati! (username:iloveyouhecried) Entry #2! I would love to try the Baby Nappy Balm from Ecostore! They carry the Cover Plugs in my State at Lok Lok Inc. in Coral Springs, Florida. I would love to win the chocolate Kaboost. Thanks for the opportunity! #2 I faved you on technorati....user name: leahita. I would go for the Charcoal, because I think that would look best with the chairs I have. Thank you for offering this giveaway. It's exactly what I need for my son. I found your site through www.prizey.net, and I'm enjoying it! Lime green is my favorite but my second choice is the Natural color. Thanks! I love the chocolate color! Thanks!